Ask for opinions on the Suzuki method for teaching violin and you'll _nd yourself lost in a maze of contradictions. "The Suzuki method allows genius to blossom," says one. "Suzuki violinists are simply brainless imitators," says another. "Everyone can learn how to produce good sounds from a violin with the Suzuki method." or "Suzuki students can't read." Who's right? What should you do? Shinichi Suzuki began developing the method with his _rst pupils in 1942 and founded the Talent Education Institute in Matsumoto in 1947. The program - actually more a philosophy of life - is explained in his book, Nurtured by Love. Over the years the method has become popular all over the world and remains so today. 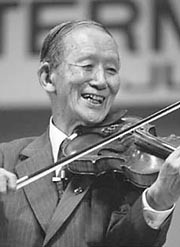 The main dif_culty in trying to compare Suzuki and traditional violin teaching is that there are several versions of the Suzuki program. To add to the confusion, a number of teachers opt for an amalgam of Suzuki and traditional methods. Age is important in Suzuki training. Ideally, toddlers who begin playing violin are two or three years old - an age when children are particularly malleable. The program even allows for training the unborn by having their pregnant mothers listen to recorded versions of the _rst pieces in the program so that the children will recognize the music instantly when they're old enough to hold a violin. This is a direct contrast to the traditional approach, which generally recommends waiting until children are between six and ten before starting lessons. Suzuki pupils begin with passive learning. Even before they hold an instrument in their hands, they watch other pupils and listen to recordings of the _rst pieces in the program as well as more advanced music. This natural immersion replicates learning one's mother tongue. The FACE orchestra conductor Theodora Stathopoulos (FACE is a downtown Montreal public school with a special mission for teaching the arts) was a Suzuki teacher for several years and accompanied her own two children while they were enrolled in the program. "All human beings are born with the ability to talk," she explains. "Babies begin by differentiating sounds, then regrouping them into words and later sentences. The process is positively reinforced by the parent, who will never say, 'Stop practising that word. You already know it!' Music is learned in the same way. Children love to mimic. In the Suzuki method, they practise a piece in small sections until they know it from beginning to end. If children like what they're playing, they will repeat the passage quite naturally. Often it's the adult who asks the child to move on because he or she is tired of hearing the same thing over and over!" What happens is that children learn _rst to play by ear - the opposite of traditional teaching methods, in which pupils hardly ever listen to recordings of the pieces they are to learn, and professors insist at the outset on their being able to sight-read. 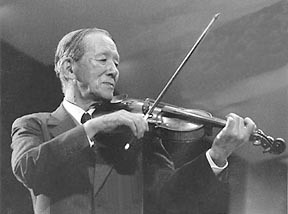 As a matter of fact, the Suzuki method's late introduction to sight-reading, which often translates into a laziness to do so when older, is frequently the target of criticism. Carole Meneghel, a teacher for 18 years, has had several pupils who went through the Suzuki method. As a beginning teacher she experimented with various methods before opting for the traditional approach. "All my pupils with early Suzuki teaching had great dif_culty with sight-reading and rhythmic precision, without exception!" she states _rmly. "Since students who learn to sight-read play just as quickly, what's the point of not teaching them to read right away? I feel the Suzuki method underestimates children's intellectual potential, because even the youngest preschoolers have no dif_culty learning to read music. At most, they have a little trouble with the mathematical side of music theory. As far as I'm concerned, you're giving someone a precious gift when you teach them to read music." Suzuki pupils are taught in a combination of group and individual lessons, which is another departure from traditional methods. It provides social interaction and gives children the satisfaction of ensemble playing in a non-competitive way. Traditional teachers prefer to have students working alone on improving their skill. Ensemble playing is not usually encouraged, or is encouraged only in a competitive environment, since auditions for orchestras - even student orchestras - can discourage students. The teaching of technique doesn't vary signi_cantly between Suzuki and traditional methods. After all, the physical relationship between body and instrument can't be altered much. Both methods focus on meticulous work methods, with attention to detail and purity of line, although the Suzuki method has a Zen component similar to that used in martial arts teaching. Traditional teachers have their own favourite areas of concentration, some focussing more on sound quality, others on accuracy or agility. Stathopoulos emphasizes parental involvement in the Suzuki programme- the last major departure from traditional teaching. "The parents must be present at every lesson and take note of all relevant points. Some teachers even like parents to learn the instrument at the same time as their child. This helps them support their children's progress at home and establishes a strong bond. Of course, parents must have the time and energy to totally devote themselves." Traditionally, parents wait in the corridor; their role is con_ned to admonishing their children to get on with practising. Unlike many traditional teachers, Meneghel strongly advises parents to attend lessons, particularly when pupils are very young. "Progress is always faster when children feel they're being supported in their artistic endeavours," she states. Whether you are "for" or "against" the Suzuki method, remember that the speed of learning depends on how professional the teacher is. Stathopoulos says, "The secret lies in a judicious mix of teaching and performing experience, in the teacher's understanding of the instrument, and in his or her instinct for knowing when to push on with a subject or a piece, and when to move on to something else." Unfortunately, there's no way of evaluating this instinct. Parents shouldn't be afraid to shop around for a good teacher and to ask questions about experienceand teaching philosophy. They can also attend a Suzuki session or a teacher's student concert to hear how well the pupils play. It's a good bet that if you like what you hear, you'll appreciate the sweet sounds produced by your little darling's violin even more! If you have access to the web, you can _nd more information at 1) the Suzuki Music Academy http://www.SuzukiMusicAcademy.com), which offers detailed information on the Suzuki method and how it can be used in schools; and 2) Suzuki Violin Teachers Central (http://www.suzuki-violin.com) , a site designed especially for Suzuki teachers.